The exhibition takes place in Amsterdam, The Netherlands, 16th – 18th June, 2016. 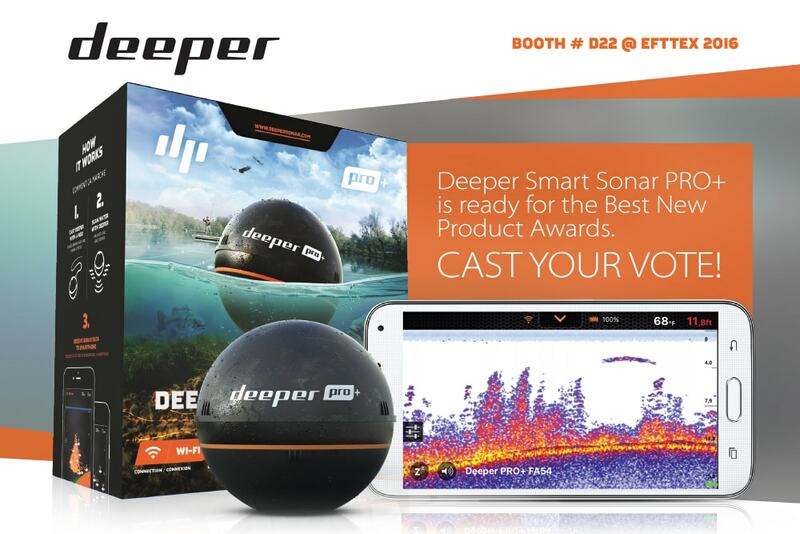 Visit Deeper booth #D22 and get to know the innovative technology that is perfectly equipped to get you to the fish. The best of its series Deeper Smart Sonar PRO+ is ready to perform it’s best at the Best New Product Awards. The product will compete in a category of the Best New Accessory and also seek your appreciation as the Best Innovation of the Year. And it’s totally worth it. Deeper Smart Sonar PRO+ uses Wi-Fi connection which secures a distance between Deeper echo sounder and the device holder up to 330ft/100 m and ensures more accurate data transfer. The outstanding Onshore GPS Mode enables to create professional bathymetric maps. Doubled scanning frequency allows to capture faster moving objects, whereas 8 times extended dynamic range enables more accurate detection of underwater units. Extended Deeper App features include Day/Night Screen Color Mode and enables to choose sonar sensitivity depending on water conditions. Using Deeper Smart Sonar PRO+ every angler can now access accurate fish finding data that was previously available only on the consoles of fishing boats. Visit Deeper booth #D22 and cast your vote!